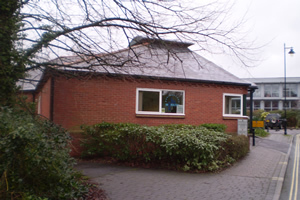 Our offices are based at the lower end of Church Street in Basingstoke. We have free parking whilst using our facility, subject to availability, and are also a drop off and pick up point for Dial-A-Ride. From the ring road follow the signs to Shopmobility. When you have driven under Festival Place on Churchill Way (heading West) you will see the turning on the left to Church Street. Follow the road down to the bottom – past Marks and Spencer on the left – and you will see our offices at the bottom of the road on the left hand side. Drive up to the barrier, press the buzzer and announce your arrival and we will give you access to the car park. Please note: If you are using a sat nav, you will need to use the postcode RG21 7QW, which will guide you to St Michael’s Church. We are the bottom of the road. Basingstoke Bus Station is in Festival Place. Simply alight from the bus and enter Festival Place by the double set of doors in the Bus Station and walk straight ahead passing British Home Stores and Next. Continue through the exit on to Church Street and turn left and you will find Shopmobility Basingstoke 100 yards up on the left. We can also meet you at the bus station with a scooter/wheelchair by prior arrangement. Exit the railway station by the main doors, cross the road and walk straight ahead. You will pass a number of shops along the way including Sainsburys and Primark before entering Festival Place. 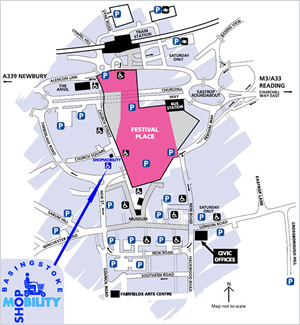 Once in Festival Place, turn immediately right down Clifton Walk and exit on to Church Street, turn left and you will see Shopmobility Basingstoke 100 yards up on the left. We can also meet you at the train station with a scooter/wheelchair by prior arrangement. Both Dial-a-Ride/Community Transport and Taxis will drop you at our door. Dial-a-Ride/Community Transport can be contacted on 01256 462101 and all the taxi companies know us well. We do need 48 hours notice if you would like to be met at the bus or train station.